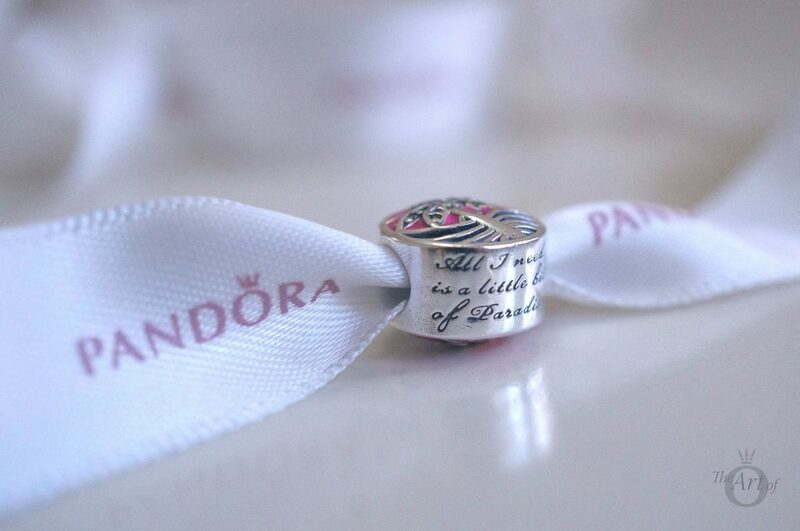 Treasure your precious memories of balmy days and pink sunsets when all you had to do was relax. 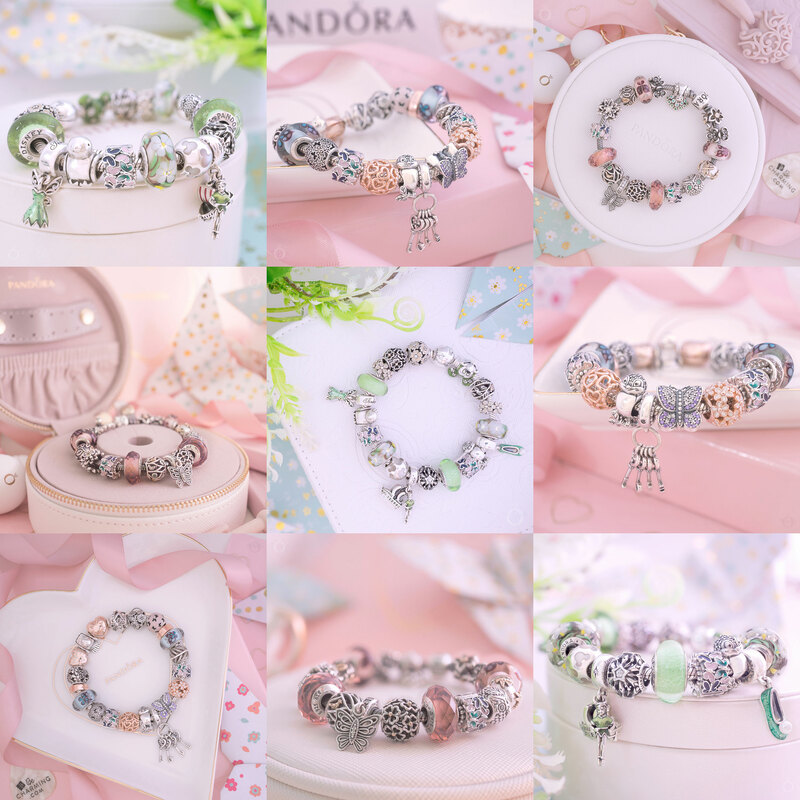 My big surprise charm from the PANDORA Summer 2017 Collection is the Tropical Sunset Charm (792116ENMX). 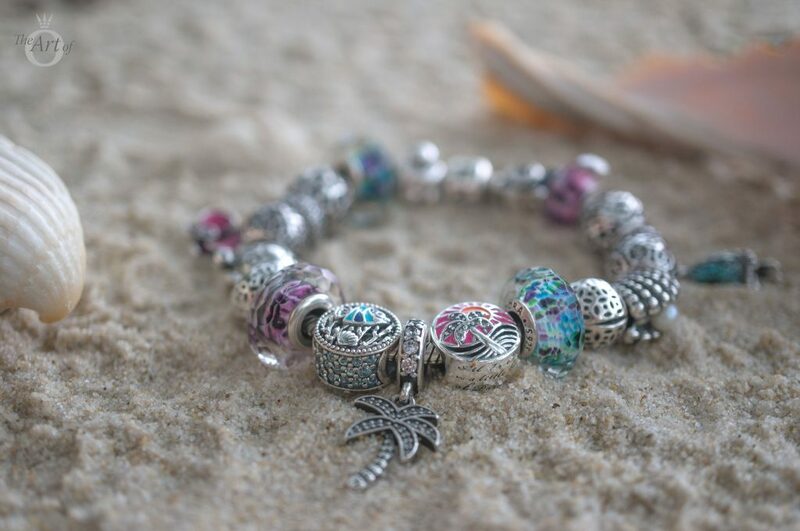 I have previously steered away from ‘button style’ charms but the Ocean Life and Tropical Sunset Charms both allured me. The Tropical Sunset charm enticed me with it’s retro vibe. The orange and fuchsia pink enamels make it fun, kooky and almost kitsch! 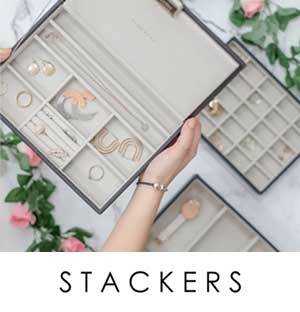 I deliberated over adding it to my collection for a while but the lively and quirky design won me over and now I love it! 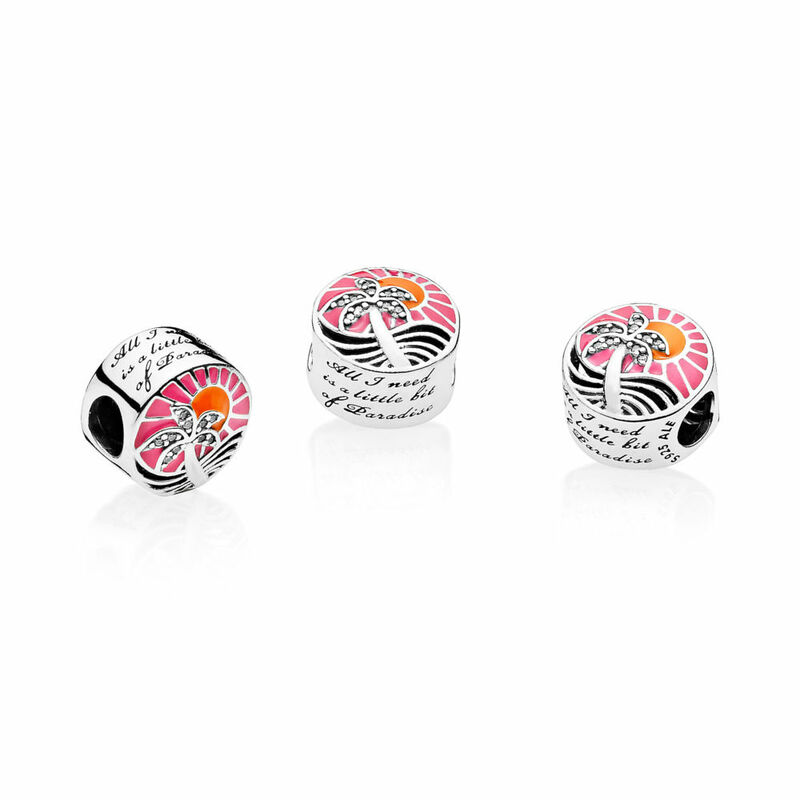 The Tropical Sunset Charm is eye-catching with its striking design in vivid pink and orange hues. The palm tree leaves are inset with cubic zirconia stones which creates an interesting contrast against the opaque enamel. 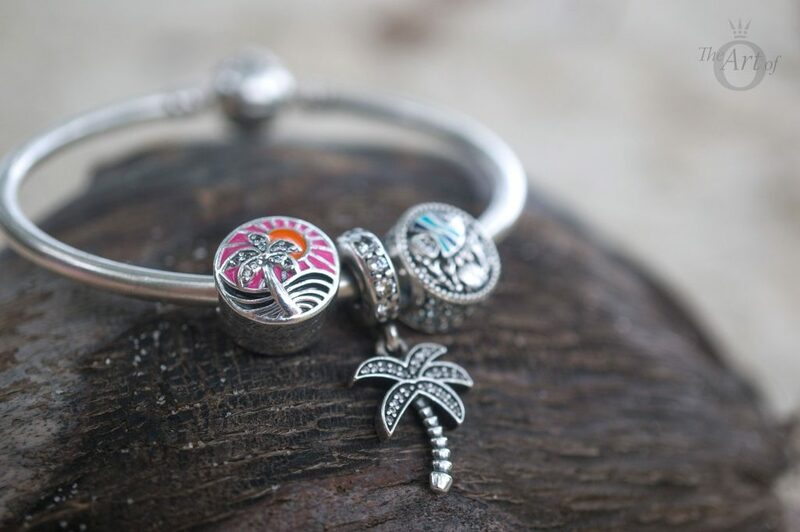 The top of the Tropical Sunset Charm is slighted rounded, providing added dimensions to the image as the light reflects over the silver elements. 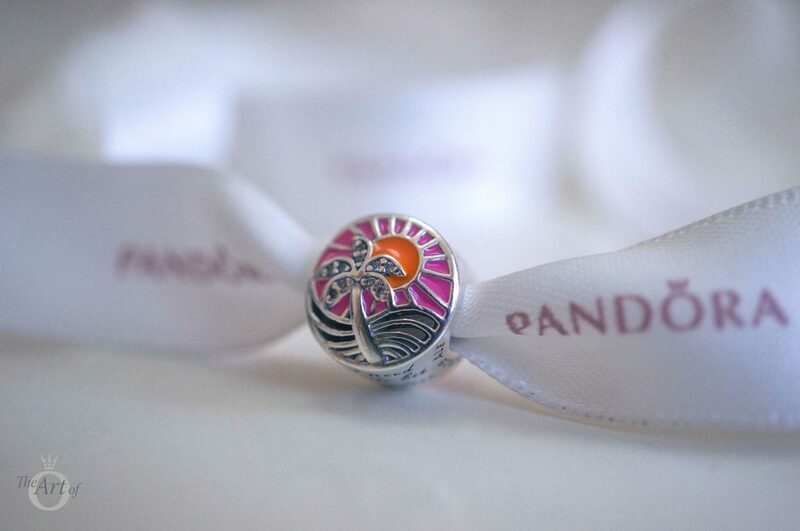 The official PANDORA stock image of the Tropical Sunset Charm is incredibly accurate in design and colour. In real life though, it is easier to see that the waves of the sea behind the palm tree are cut out from the image. 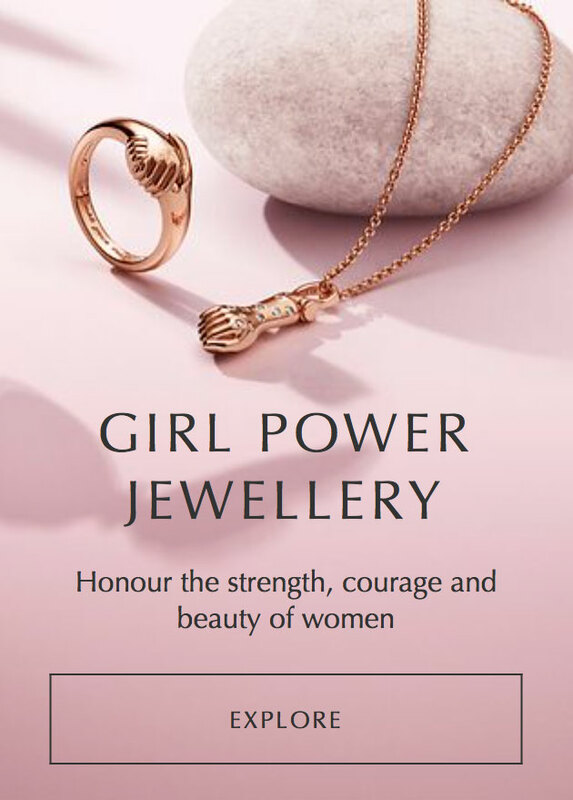 At a quick glance of the stock picture you might assume they were black enamel. 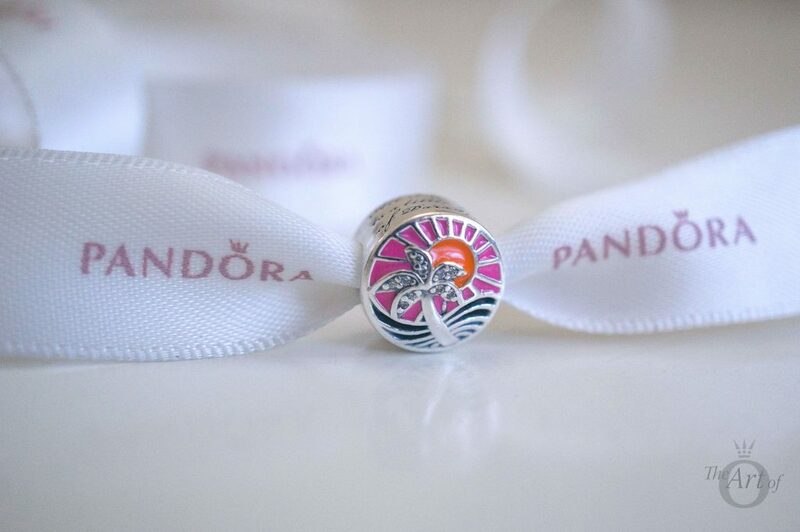 The normal PANDORA hallmark is tucked neatly around the side of the Tropical Sunset Charm and is hidden once it is worn next to other charms on a bracelet. 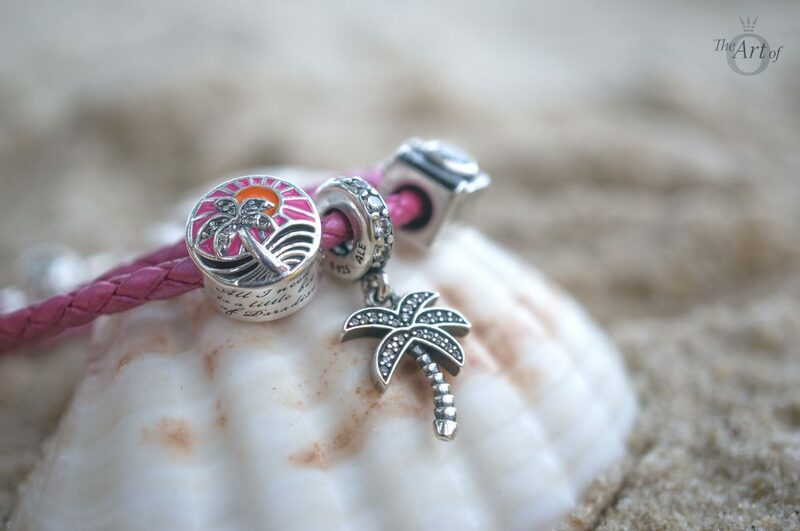 One of the details that I love about the Tropical Sunset Charm is the sweet inscription at the top and bottom of the charm; All I need is a little bit of Paradise. 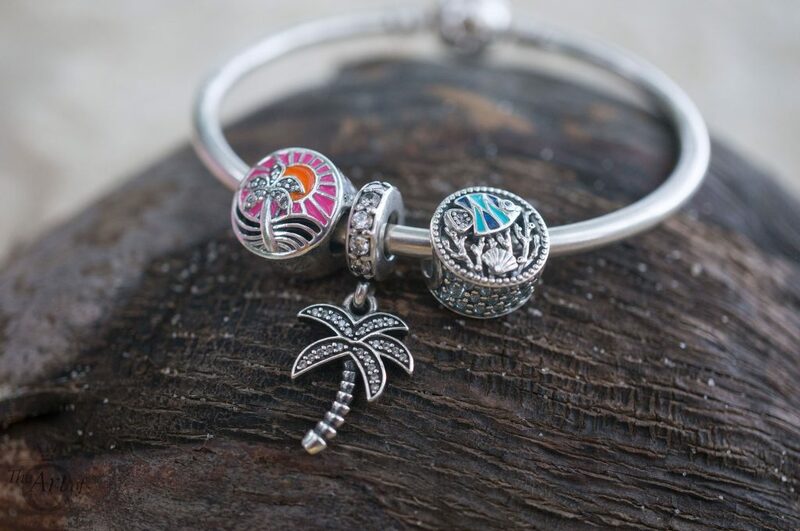 It makes the Tropical Sunset Charm the perfect souvenir to remember your summer trip and a quick peek on a dreary Monday morning will carry you back to beautiful beaches and stunning sunsets! 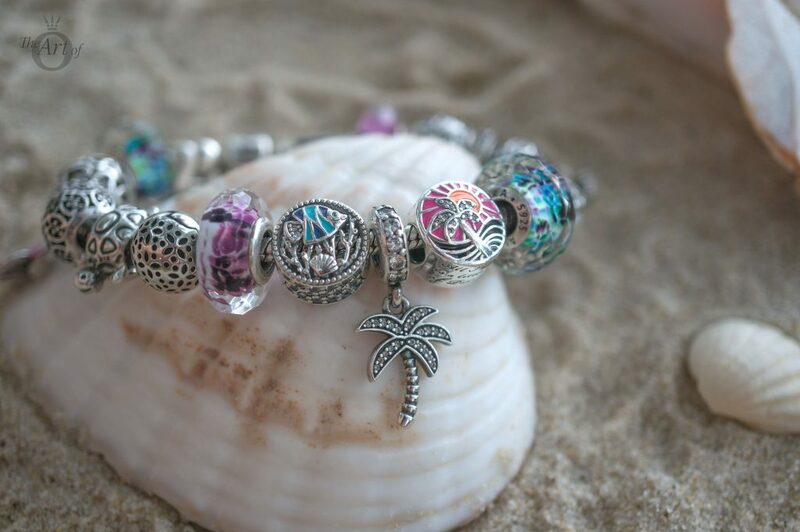 My first design with the Tropical Sunset charm is a mini ‘Tropical Snapshots’ theme. 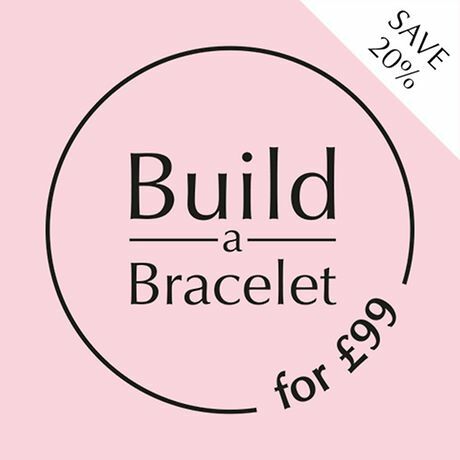 The Sentimental Snapshots (791709cz) with its dark black enamel looks striking against the Honeysuckle Pink Leather Bracelet (590734chp-d) and makes it a bold and fun style. 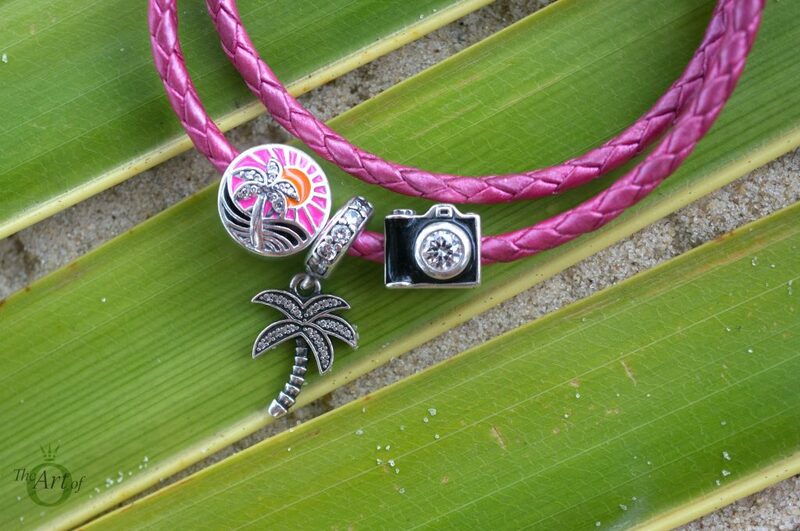 The three charms almost tell a story of seeing a gorgeous scene of a palm tree in the warm breeze, taking a photo to capture the moment and the image held forever in time in the Tropical Sunset Charm. 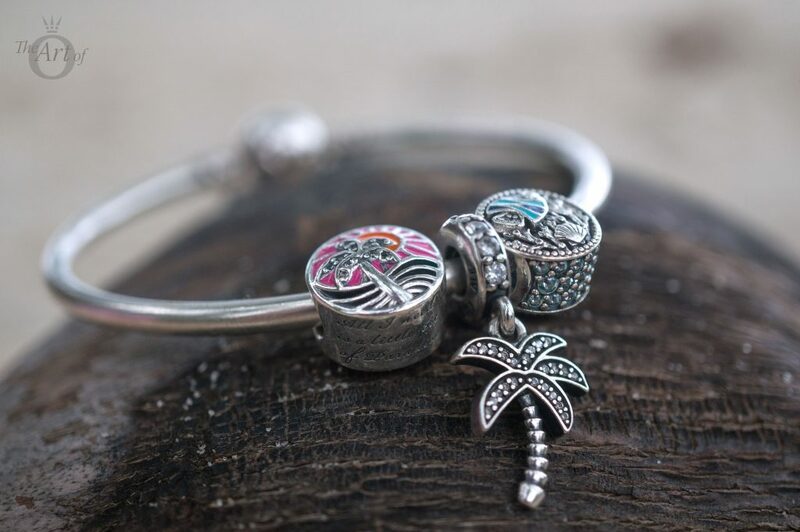 In my second design I paired the Tropical Sunset Charm and the Ocean Life Charm (792075ENMX) with the Sparkling Palm Tree Pendant (791540cz) nestled between them. 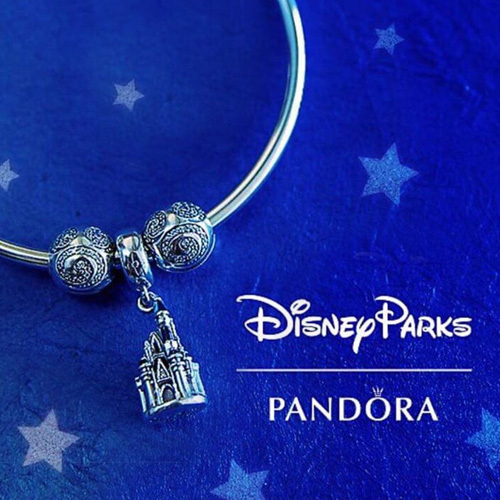 Despite the bright, glossy enamels the design looks polished and refined on a simple PANDORA Bangle. My final design is bursting with Summer fun in vibrant pink, purples and teals. 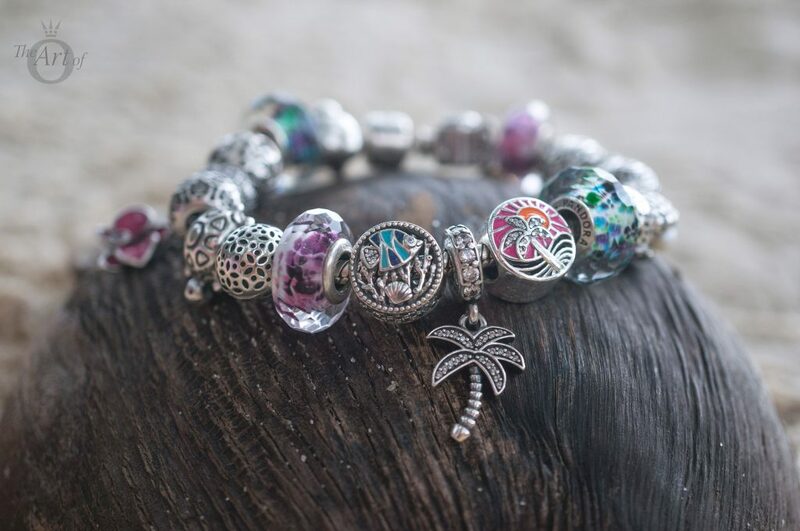 The Tropical (791610) and Shoreline Sea Glass (791608) Murano Charms harmonise the multiple colours used in the bracelet. 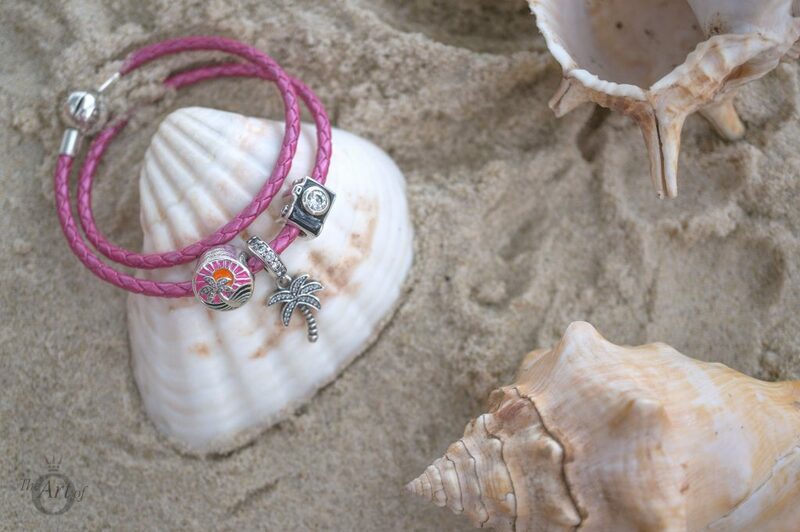 The Pink Orchid (791554en69) and Tropical Parrot (791903enmx) Pendant Charms add to the summery feel and create balance to the design. 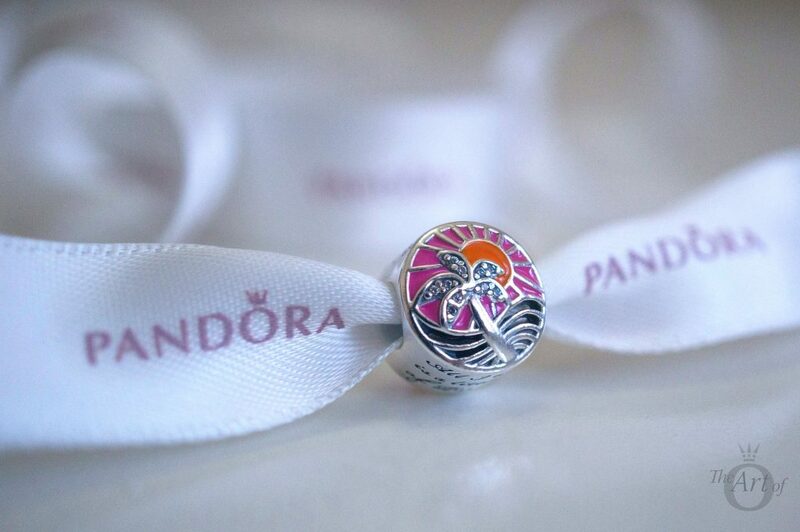 My verdict on the Tropical Sunset Charm? 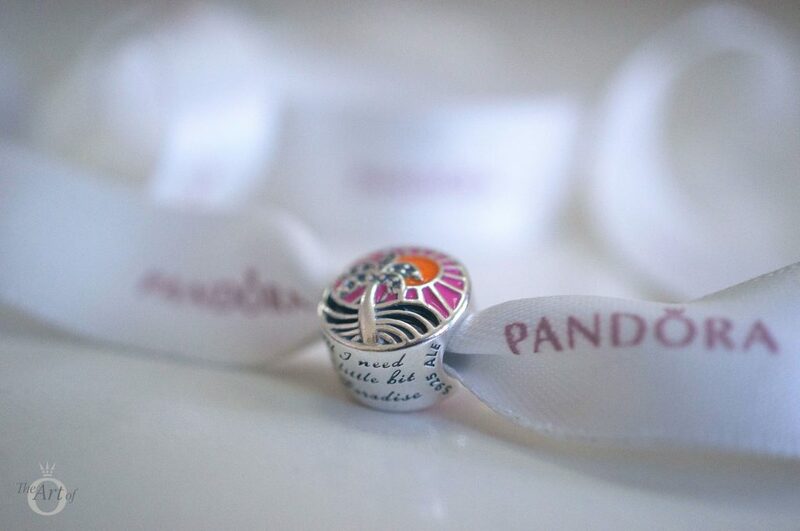 A taste of Paradise! 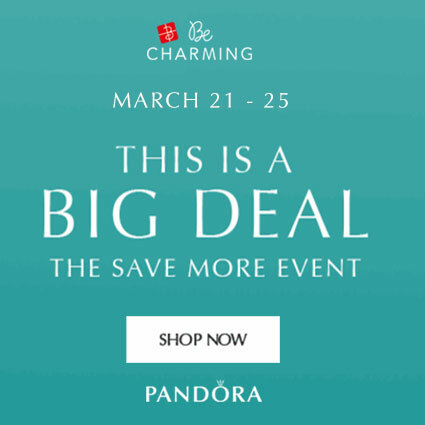 The PANDORA Tropical Sunset Charm (792116ENMX) is available for $70 USD / $80 CAD / £55 / €65 from our preferred PANDORA retailer BeCharming.com. 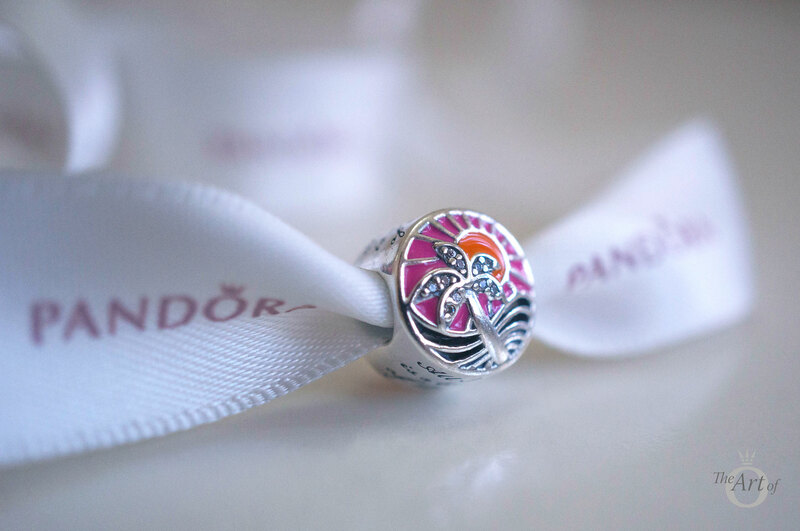 Have you bought the PANDORA Tropical Sunset Charm? 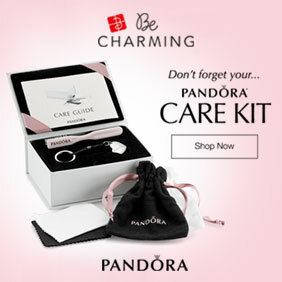 Or is it on your wishlist? 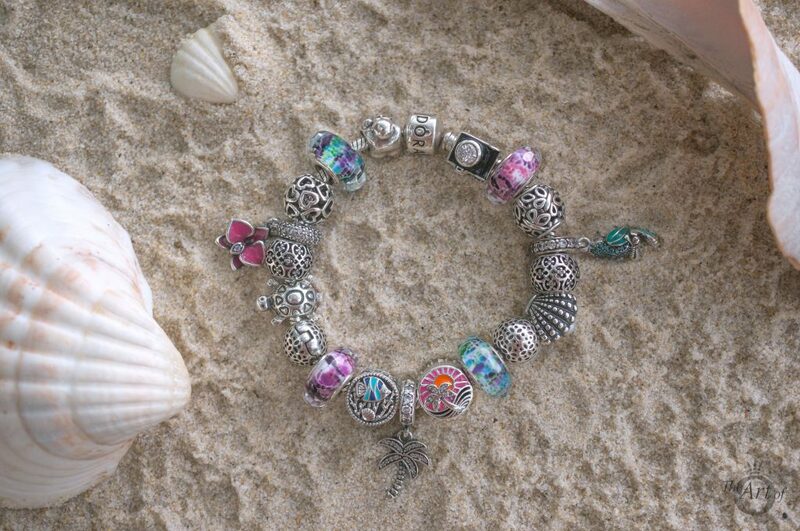 Do you enjoy fun charms like the Tropical Sunset or prefer charms with more of a grown-up feel? Let us know in the comments below.